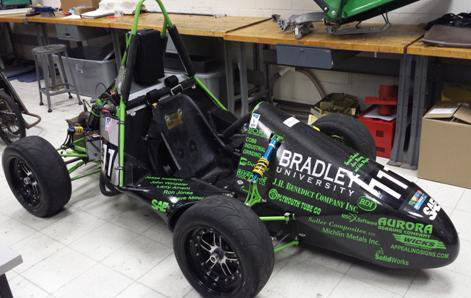 Catastrophic vehicle failures have abruptly ended Bradley University’s ability to compete in the annual SAE formula car competition on several occasions. The failures can be attributed to the lack of an effective warning system utilized by the current vehicle display system. The new data acquisition system would expand and improve on the current system, providing the mechanical engineering department’s Formula SAE team with an advantage over their competition. Implementation of a new, more advanced system could greatly reduce the team’s risk of catastrophic vehicle failures. With proper notification, problems can be recognized and addressed before serious failures result. Addition of this system will help keep the driver safe by reducing the likelihood of engine or vehicular damage. A weak vehicle chassis or unstable engine could put the driver in a very dangerous situation. At high speeds during practice sessions or a race, vehicle failures could put support personnel in jeopardy as well. By providing advance warning of possible areas of concern, the driver will be kept well informed and can take proper measures to avoid injury and vehicle damage. Reducing vehicle failures will also reduce automotive fluid spills on the racetrack, thereby maintaining a safe race environment and preventing contamination of the environment.